Zoho Mail is an email hosting application designed for the modern business world. State of the art functionality is the hallmark of Zoho Mail and allows business users to effectively communicate. 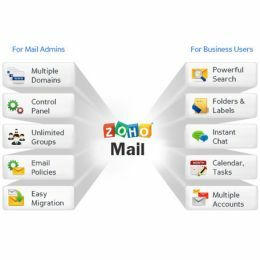 At the same time Zoho Mail's customization and mailbox management functionality effectively meets the needs of IT administrators. Furthermore, Zoho Mail seamlessly integrates with more than over twenty other Zoho applications which leads to improved productivity and better internal and external collaboration. Zoho Mail provides comprehensive domain management options for your company, by providing new domain registration, multiple domain management and mail hosting for an existing domain. The powerful administration control panel with its clever interface provides administrators with total control Zoho Mail functions. For example, email restriction policies, domain management, and group management. Administrators can also introduce multiple aliases for business users which allows them to change the 'From' address in emails to effectively balance the message, recipient and sender. And administrators can also organize email accounts into groups so that messages can easily be exchanged and shared by users. Zoho Mail can block emails based on IP Address, manage domain and subject content for the entire company, control both incoming and outgoing mails, manage blacklists and white lists. It is so easy to move up to Zoho Mail. Store and view search criteria in separate tabs. Highlight and filter emails, tag them with labels and move them to specific folders. Use Zoho Mail to organize them into folder structures and also tag them with labels and colours customized for your operation. Zoho Mail comes with a really cool integrated live chat feature that will allow you to collaborate more easily and to discuss important business matters make better decisions faster. Zoho Mail keeps track of important tasks, share calendars, take notes, making collaboration much more effective.